PIPE PIER® Supports Are Well Constructed, Durable, Easy to Install, Versatile, and Cost Effective. Only the simplest tools are required for support system installation; even long runs or multiple pieces install quickly and precisely on the rooftop or in floor. 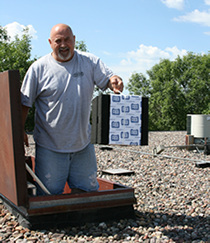 A lightweight ten-pack of supports weighs only ten pounds and is easily transported to the roof. PIPE PIER® products can be used in hundreds of combinations to solve nearly every pipe, equipment, ducting and conduit support challenge and allow you to mount breaker and junction boxes safely off the rooftop level. The galvanized, stainless steel, or High Density Polyethylene (HDPE) channel accepts readily available strut clamps and accessories. PIPE PIER® supports meet standards of the American Society for Testing and Materials (ASTM) to ensure the strength of each PIPE PIER® component. 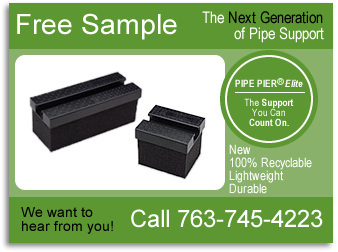 A sample of each shipment is independently tested to meet PIPE PIER® specifications. PIPE PIER® pipe support system reduces maintenance, capital cost, and labor.